The natural movement of an observer’s gaze over a scene is discontinuous, as illustrated by the green trace in Figure 1. One might assume that classifying eye fixations and the rapid movements between fixations—saccades—from such gaze data is straightforward, but in practice it is not. A variety of thresholds for speed, acceleration, duration, and stability of point of gaze have been proposed to help demarcate data, but the values of these thresholds can vary with the observer, the image being viewed, and the task required of the observer. Figure 1. A typical eye-movement trace (green line). The vertical scale bar at the top right indicates 1 deg visual angle and the inset at the bottom left shows a magnified version of the lower section of the trace. 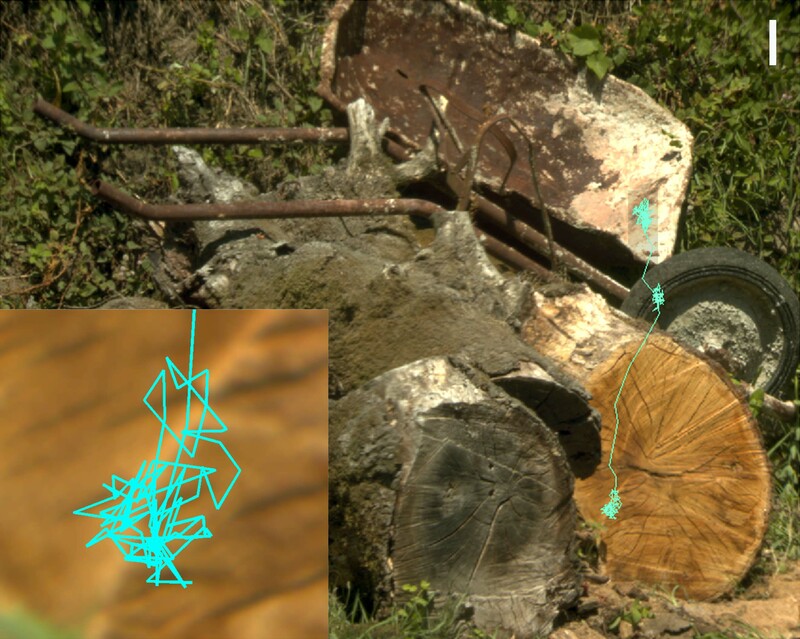 The scene image has been darkened locally to show the trace more clearly. In an alternative approach, Mould et al. (2012) have described a simple automatic method, available here, for classifying fixations and saccades that does not depend on parametric assumptions or subjective hand-tuning of thresholds or expert judgment. The method of Mould et al. (2012) uses only some general distributional properties of eye movements and adapts itself to different observers, images, and tasks, and can be applied to large data sets with gains in classification rate and subsequent analysis. It is primarily speed-based, but the required optimum speed threshold is derived automatically from the data with the aid of Tibshirani, Walther, and Hastie’s gap statistic (J. R. Stat. Soc. Ser. B, 2001, 63, 411-423). An optimum duration threshold, also derived automatically from the data, is used to eliminate the effects of instrumental noise. Details of the method and a comparison of its performance against that of expert classifiers and other parametric methods are given in Mould et al. (2012). MATLAB software for classifying gaze data by this nonparametric method is available here, including test gaze data for verification. MATLAB is a product of The Mathworks, Inc. (Natick, MA, USA). The software was tested on MATLAB version R2012a.